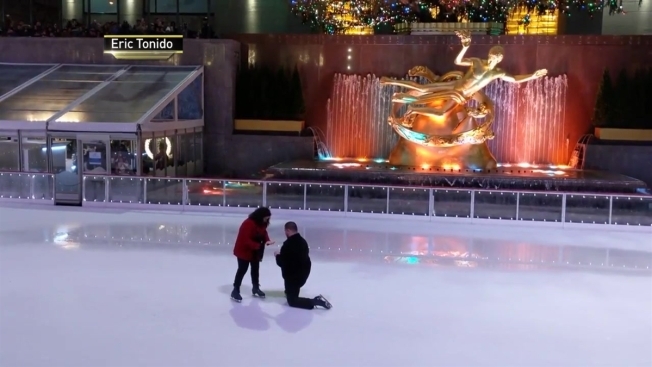 "It was a truly magical fairytale moment"
A beautiful and unintentionally comic surprise marriage proposal was caught on camera by onlooker Eric Tonido at Rockefeller Rink on Saturday. Tonido says he was visiting New York from Toronto and had always wanted to see the world-famous rink. "As they removed the skaters to make way for the ice resurfacer, I noticed the two getting on the ice, so I kind of clued in," he said. The happy couple had the whole rink to themselves as they gripped each other unsteadily and stared into each other's eyes. After building up some stability, the man suddenly dropped to one knee, presenting a ring to his partner. 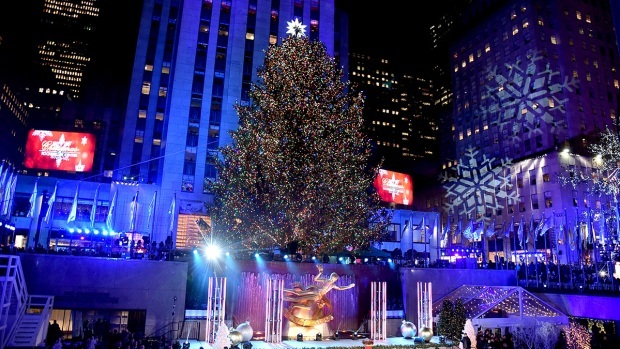 She said yes, they kissed and the crowd surrounding the Rockefeller Rink, a tourist hub during the holiday season, erupted into applause for the happy couple. But the applause soon turned to laughter and cheers as the kiss threw the woman off balance and she slipped onto the ice. "As you can see on the video, the crowd was very happy for the couple," Tonido said. The woman laughed the fall off, and it only seemed to make the moment more magical. After WNBC reported the special moment, the couple came forward and identified themselves as Amanda Szymanski and Brian Skolar. "It was a truly magical fairytale moment," Szymanski said. "My fiancée has been planning this since May and everything was kept a secret until Saturday when he got down on one knee and asked me to marry him. I was blown away."